We can see forever on a clear day. Isn’t it remarkable? The feeling we get when we can see with such clarity? You can see forever and ever and ever more. …I love this song. It describes the person (we are) capable of seeing through our own eyes on a clear day. It speaks of the ability to hear and see things near and around with a heightened sense unlike before. Bringing the person (you and me) into a state of mind to realize that we can present a larger perspective to the world around of who we really can be are. We are really that person whose outlook is broadened because we see things from a fabulous new perspective. A perspective of greater dimension unfolding. How does this tie into our Mary Kay business you ask? Each morning lends new meaning to the day ahead. A fresh approach to the day will be affected by the clarity that lies within you. You are the most integral part of your business. Your perception of knowing that you shine brightly illuminates your persona to those around you. A confident woman with a dream and a mission to make things happen. A consultant who cares enough to care about others. To listen and to hear the skin care and cosmetic needs of women whose path you cross. Always remembering to complete your wardrobe with a smile. Being a woman of your word. Absorbing the pleasures from a people oriented business. Becoming a sponge of knowledge in your Mary Kay educational experiences to enhance your growth experience, both professionaly and personally. Yes, on a clear day you can see forever. The view is so crisp. You step forward to take a look. You feel like you’ve never felt before. The glow of your very being elevates to a whole new level. You are someone’s personal Mary Kay Consultant. A shining light from within. What a blessing you are to others! 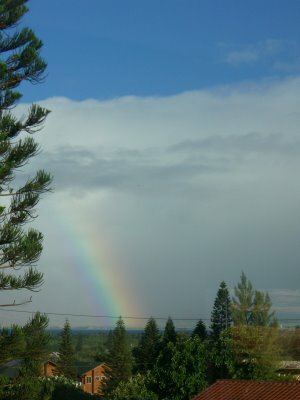 The above picture captured a beautiful rainbow outside a window in Hawaii. I really like the beautiful photo. PB. The song above was chosen by one of my unit members when she and her team earned her first car. The words are truly uplifting. What a nice compliment, thanks so much! I love what a clear day can do for our thinking at times, don’t you? I’m already setting my goals for the new Mary Kay year ahead in July. Now, that’s vision for me!! Mere, thank you for your kind compliment. Your love for Patch must be experiencing peace of heart through the endearing words you’ve received from so many. Everyone feels your heart on your loss, and knows too that words may never be enough, but caring feelings will surely endure. A warmth that will remain over time. Feeling the warmth is to feel life again.